that local TV will go digital by 2013.
digital signal by late 2011. South Africa’s final switch from analogue to digital terrestrial television (DTT) has been shifted to December 2013. The shift will enhance the quality of television broadcasts and open up opportunities for more free-to-air channels to enter the market. 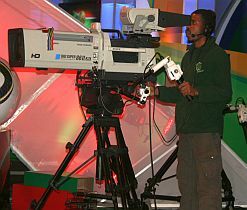 Sentech, the country’s signal distributor, will be responsible for switching the television broadcast signal over to digital by 2013. The new date was adopted following discussions in December 2010 by ICT ministers of the Southern African Development Community (SADC) member countries. It was concluded during these talks that the region’s television transmissions should migrate to digital by that year. 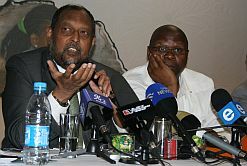 Roy Padayachie, minister of the Department of Communications, confirmed the government’s decision at a media briefing in Midrand, Johannesburg, on 14 January 2011. The switch-over was initially set for November 2011. Millions of viewers without subscription to satellite television currently have access to just four channels, but they will be able to view about 15 when the digital migration process is complete. “Viewers will also have crisper and clearer pictures coming to their television screens,” said Padayachie. The South African government has opted for DVB-T2 as the country’s DTT standard, while 11 other SADC countries have agreed to adopt DVB-T2. Brazil had previously approached the South African government to adopt the ISDB-T standard, but after investigations, South Africa was satisfied with DVB-T2. DVB-T2 is an improvement from DVB-T, which the country chose when it first revealed its Broadcasting Digital Migration policy. Broadcast organisations and signal operators started DTT trials in October 2008. 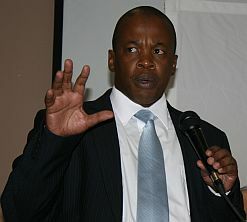 Sentech said it’s aiming at covering 60% of South Africa with the digital signal by 2011. The move will allow for high-definition (HD) television viewing, which produces a substantially higher image resolution. HD television sets are already available on the local market, and those who own them, will not be affected by the transition to the digital signal. But millions of poor South Africans still have the standard-definition television sets. Their transition to digital television will be simplified by set top boxes, which will make their sets compatible for HD viewing. The set top boxes will be costly, but Padayachie did not want to speculate the price. Experts have estimated that the cost will be in the region of R700 (US$100) or more. The government has made it clear that it will subsidise South Africans who cannot afford the original price. The set top boxes will be manufactured in South Africa, which will stimulate the local manufacturing industry and create more jobs, the Communications Department noted. The local industry could also tap into a market of about 130-million people in the SADC region. Padayachie said SADC countries have expressed interest in having South Africa produce set top boxes for them. “They are really saying ‘well you have a manufacturing base. You can manufacture for us’,” he said. Having more free-to-air television stations will also be instrumental in creating job opportunities. “A major benefit will be in content development in the country. Just imagine what that would do for job opportunities,” said Communications Department acting director-general Dr Harold Wesso. “There will be a lot of opportunities for our youth to get involved in the technology,” Wesso added. A digital signal will also open up opportunities for more community television stations.